Evergreen High School tutors have been working with younger students on various assignments. Evergreen Local Schools is participating in the Students for Other Students (SOS) tutoring program. 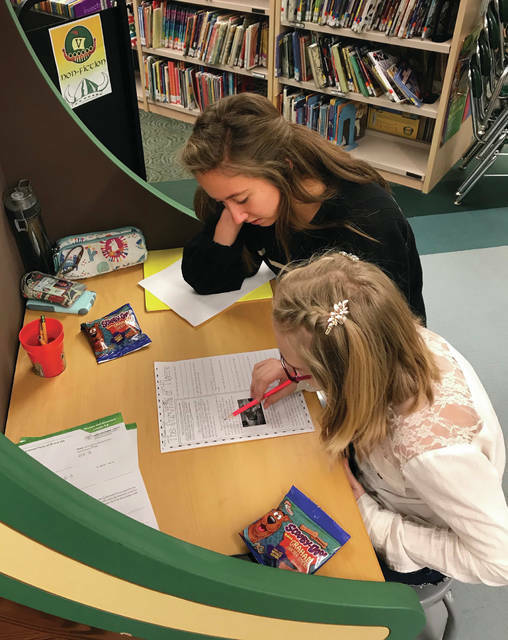 According to Kristin Carrisalez, Evergreen elementary teacher and program coordinator, SOS pairs students in grades three through eight who are academically struggling with high school student tutors after school to work on lesson reviews, assignments, and homework. Tutoring sessions officially began in February; however, high schoolers began the application and interview process just before the holidays. There are currently 15 high school tutors working with 30 students. The tutors and students are paired based upon the high schooler’s academic strengths. Tutoring sessions are supervised by Carrisalez and take place after school on Tuesdays and Thursdays from 3-4 p.m. in the elementary building. Bus transportation to students’ homes is provided. The tutoring service is offered to students by teacher recommendation. Funding for the program has been provided by an anonymous donor and pays for tutor wages, snacks, and transportation. The SOS program will run through April 2019. Any parent who thinks their child would benefit from the SOS tutoring program is encouraged to talk to their child’s homeroom teacher.